We can give that experience to one another. It's the work of being human. 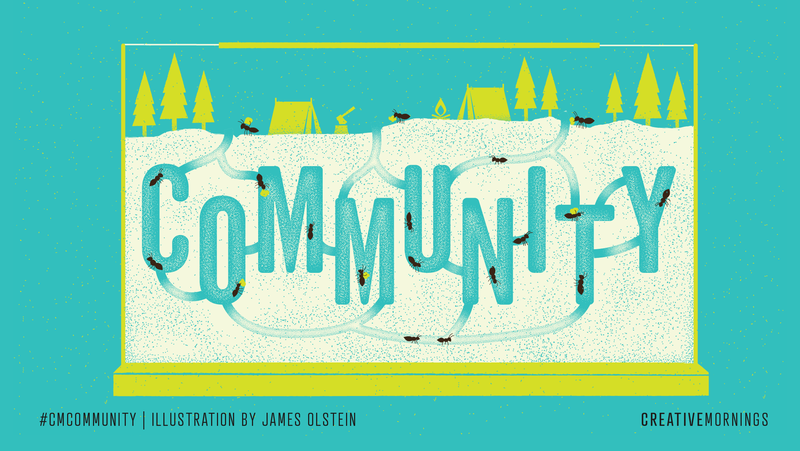 This month's global exploration of Community was chosen by our Philadelphia chapter and illustrated by James Olstein. Giulia McGauran Say 'Oooh!' leads to many more Ooohs! Community WRO Audience takes the stage! Sara Hashim If You Move Around A Lot, How Do You Find Community? Jennifer Moore Building Community around Sustainable Style. How can we set everyone up to win? I believe that art can fill in the gaps where language fails. Si no tienes "haters", no eres absolutamente nadie. Porque el éxito se lleva muy mal entre los demás. La "fórmula secreta": Trabajo duro, constancia, humildad, coherencia, comparte, compromiso, sé tú mismo. If we're talking about community, more than anthing with anything, I think that by being genuinely interested it helps to build that. By following your 'ooohs' is the best way to keep having more 'ooohs'. Whoever you're working with, no matter what they do, or who they are, it's wonderful to be able to work out what they're about and from there you can play, problem solve, explore, and take risks. I knew from art school that to keep these 'ooohs' coming, you need to learn more about everything. What daily habit adds to your stress? Take the time to pause and see how things are influencing you. You can give meaning to the mundane. Intention plus action equals magic. The key is to have practices in place where you’re constantly checking in with yourself so you know how you’re doing. You know if something’s off. Intention is less about what you are doing; it’s how and why you are doing it. Living with intention is a key player in reducing the stress in your life. It is our responsibility as the creative class to speak up, to bring people with you, to bring people together, and to look out for others. I believe that art and arts has a place to build community for us. In Ottawa and Gatineau [...] we commute and use the bridges. There are four bridges, why not build a fifth one? A virtual one, and meet together and get interest in the other culture. Voices that are on the outside—how can we bring them to the inside of our community cypher? We believe in the power of community. We believe that communities are abundant—with not only creativity and potential—but this is where change will happen. Social justice is rooted in love—that you love people so much that you want everybody to be free. The streets are not just lanes of tarmacs—the streets are the veins of the city, and the people are the blood that keep it going. Listen to that beating heart, and remember that the streets belong to us, and it is our duty to help everybody that lives in them. Real change is made when lots of people do a little, and we all have that capacity. By helping those who are less fortunate than us, we are helping ourselves, too. We are helping to provide a brighter future for everyone around us, and for our children. Inclusive communities prosper. Marginalized communities fail. Idealism without pragmatism is misguided, and pragmatism without ideals is cold and mechanical. Being comfortable is one of the worst things you can do for yourself because it's not until you're uncomfortable that you become comfortable with yourself. I was trying to relate or to belong to a particular community and I wanted to share all these different things, but I didn't know exactly what it is I wanted to share. I didn't know who I was, I didn't know what my interests or goals were. It was extremely hard to connect with people because I didn't know what I wanted to connect with. It's important to understand that while we're building our communities, we really have to do everything we can to support it. If one of us succeeds, then all of us succeed. Community doesn't start with finding people that you can share these experiences it. Community starts with finding yourself. When we come together with our power, our resilience, and our resistance, that we are a force. The foundation of activism, I believe, is love. I believe it is hope. I believe it is sacred and ancestral. It is radical visions of liberation that are more spiritual than anything of this place. Being in the community is how I survived. What you measure is your mission. We are not designed to be alone—we are designed to be connected. What community demands is the best of you. At the core of our identity, we share a reality that we are all human. We think we are supposed to be passionate about what we do, but when we are passionate about who we are it changes everything about what we do. In a culture that elevates what we do and the value of the individual, we struggle to see beyond just ourselves. We struggle to see the bigger picture of who we are. I believe who we are is way deeper than what we do. I didn't know who I was as an individual. I didn't know what my interests were, what my goals were. So, it was extremely hard for me to connect with people, because I didn't know what it was I was trying to connect with. What you measure is your mission. Whatever business you are doing, if all you are measuring is your bottom line, well that's your mission, the bottom line. But if you are measuring something that has to be measured through the story - meaning actual change, actual real life stuff happening - well, then there are some things that can only be measured by the story; they can't be measured by a number. And we have to ask ourselves, "Am I just consuming life, or am I actually cultivating life." August 10 Community - publiczność przejmuje scenę! August 17 Community Lightning Talks! August 31 Cristian Lupsa on "Community"